Hair was either left down or slicked back into simple ponytails, although there were a few of our favourites sporting Hollywood curls the beach waves were most certainly gone. Here’s a few of my faves and how to get their looks….. 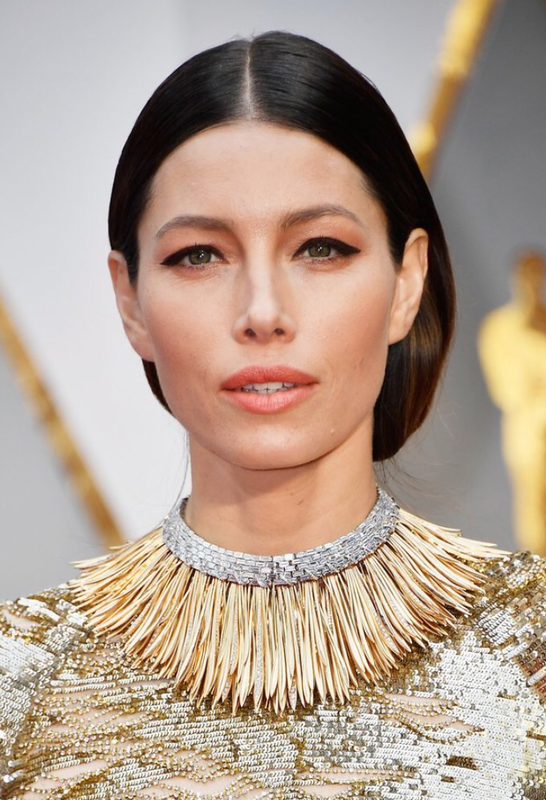 If you loved Jessica Biel’s slicked back centre-parted updo from the front get a load of the back…. There was an unexpected twist which was a refreshing change from our usual buns and chignons and as Justin Timberlake said in a red-carpet interview, everything about his wife is ‘perfection’ tonight. She’s got our vote! Product list used by hair stylist Adir Abergel: Dyson Supersonic, Mason Pearson hairbrush, Virtue the polish anti frizz creme, Virtue one for all 6 in 1 styler, Virtue perfect ending split end creme. Lots of clips. Split hair and blowdry smooth using anti frizz creme. 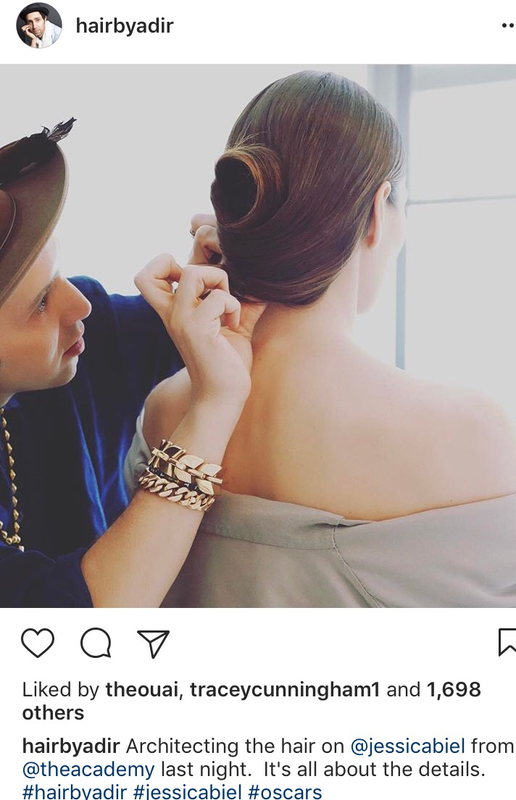 Pull hair back to the nape of the neck and start to twist upwards into a French roll,secure with pins, trying to wrap the ends around the top of your roll like a swirl. Finish with hairspray and gloss serum. Charlize Theron One of my personal favourites, Charlize embodied Hollywood glamour with a modern edge. Combining a retro style quiff with an effortless ponytail I think was brave but it worked. Product list: DAFNI go hair straightening brush, backcombing brush, fine tooth comb, Carin Beeswax finishing creme, L’Oréal Elnett hairspray. Smooth hair straight with the DAFNI go straightening brush. The DAFNI go works great on shorter hair and smooths without flattening.Leave out front section/fringe and pull the rest of your hair into a low ponytail using finishing creme to smooth.Backcomb front section and pin or spray to the side in a quiff. Finish with spray. Emma stone A true Hollywood goddess with 40’s inspired polished waves. Product list: L’Oréal Paris Advanced Hairstyle Boost It Volume Inject Mousse, Dyson Supersonic Hair Dryer A one-inch curling iron, L’Oréal Paris Elnett Satin Hairspray, soft bristle brush. Apply mousse and blowdry to get a little volume into your roots so the curls aren’t flat. Use your wand or curling iron to make waves going away from your face. A soft bristle brush and your fingers are key for breaking up the curls, finish with gloss spray. Olivia Culpo Another sleek haired beauty this time with a deep side part and separation around the face. TRESemmé Extra Hold Gel, TRESemmé Keratin Smooth Shine Serum, Ghd air Hairdryer, TRESemmé Keratin Smooth Heat Protect Spray,Ghd platinum styler, TRESemmé Keratin Smooth Hairspray, fine tooth comb. Prep damp hair with TRESemmé Extra Hold Gel at the roots and use TRESemmé Keratin Smooth Shine Serum at the ends. Create a deep side part then use the Ghd air hairdryer and a ﬁne tooth comb to dry the hair forward onto your face. Blow dry the rest of your hair straight using a smoothing brush. Spray TRESemmé Keratin Smooth Heat Protect Spray and run the Ghd platinum styler through your hair from root to end. Separate the back section of the hair from the front and gather the back section into a low pony with a smoothing brush thats been sprayed with TRESemmé Keratin Smooth Hairspray then secure with an elastic. Add the front sections to the back pony then secure with another elastic. If your hair isn’t long enough you might want to add a ponytail hair extension piece then ﬂat iron the length of the pony with the Ghd platinum styler. Run TRESemmé Keratin Smooth Shine Serum through the length of the pony. Wrap base of the pony with a velvet ribbon, then secure with a bobby pin and tuck ends in. 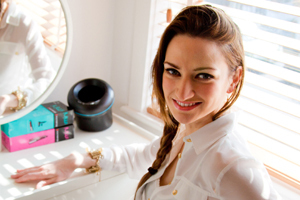 Previous Article← THE BEST CHRISTMAS GIFT LIST FOR THE HAIR OBSESSED! Great Oscar hairstyles! I am sure all these looks need a great hair styling comb and professional hair comb. Professional hair comb manufacturers has done a great job by making versatile styling hair comb. I really love Emma Stone’s! Perfectly fits her facial structure! !